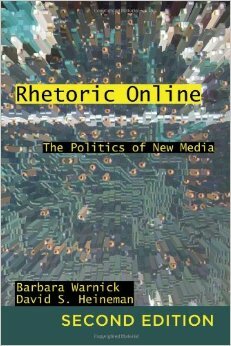 Chapter 1, “The Internet and the Public Sphere,” is laden with rhetorical theory and definitions. Warnick and Heineman include many concepts from theorists which are the basis for the following chapters which are reviewed under the 'Bright Meadow' tab. Public and private sphere discussion and counterpublic discourse is presented from Jürgen Habermas, Nancy Fraser and Michael Warner. “Scandal politics” is discussed from the point of view of Manuel Castells as well as his theories on mass self-communication and infotainment. Several pages are committed to Jamie Sky Bianco and the rhetoric of security on Facebook and similar networking sites. Slash fan fiction and web communities and the effects of social networking in the public sphere are represented by the ideas of Anee Kustritz and Clay Shirky, respectively. This is not a complete list of the rhetors and scholars who are presented in this chapter or in the remainder of the book. However, all of the rhetors ideas are necessary to study and grasp to fully appreciate and understand the remainder of the book. It is essential to fully comprehend the theories before analyzing political activity in a rhetorical manner. I would recommend spending several class times discussing the Preface and Chapter 1 due to the amount of information contained therein.